I posted about the creepiest amusement park I’d ever been to last year, but Shijingshan Amusement Park appears to be a close second. It looked far too similar to parts of Disney theme parks, so it had to die. Its characters bore strong resemblances to Donald Duck and Mickey Mouse, although typically their Snow White is more disturbing than the original. 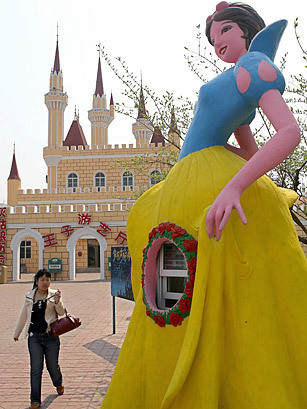 And the park’s slogan, “Disney is too far, please come to Beijing Shijingshan Amusement Park”, was possibly a little too obvious. Well, I’m gobsmacked for one. “Snow White” wearing a scale slip of sash windows. Who’d have ever thought. And the wonder of having a “Rose window”, just to the left of center, in a skirt. That fashion would definately get our public schools in an uproar. Not to mention our religious ones. Is it an undercover ticket booth? Where did she order the skirt from? The Reeperbahn in Hamburg? Would have gone well in Admin’s high short story Enjoy. NOw, I know I don’t always proof too closely before I hit submit, but I double-checked “public schools”. I did, certainly did. That window is a bit peep show-ish, but I think it’s the alarmingly pink skin that I find most discombobulating. It’s like she has 3rd degree burns. Actually, I’ve just noticed the interior of the rose window is the same colour, which is sending my thought processes spinning off into all sorts of weird directions.